A quintessential grand-class ship in the Princess fleet, the Emerald Princess creates a fun, relaxed cruise experience without being over-the-top or kitschy. Sailing primarily along the Pacific Coast, the Emerald Princess mainly offers adventurous expeditions to Alaska and Mexico, but also travels as far south as Chile and Cape Horn. With an exceptionally high level of service for a ship of its size, this vessel has been delighting passengers since 2007 with its attention to detail and modern charm. 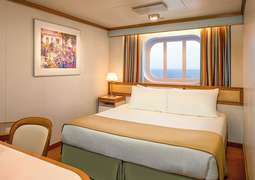 The Emerald Princess’ staterooms balance comfort and functionality with their no-nonsense amenities, understated elegance and space-saving design. 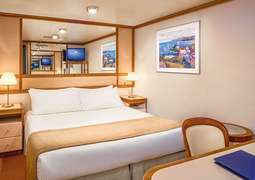 All staterooms come with a TV, refrigerator and closet, and the suites have a separate sitting area, a bathtub, and high-quality amenities. Suite guests will also have special privileges such as 24-hour room service, a mini bar, and special access to the Lotus Spa Thermal Suite. The gem of the Emerald Princess, “Share” by Curtis Stone offers a one-of-a-kind culinary experience in six courses. Guided by a unique philosophy, the “Share” experience encourages guests to connect with one another as they share a meal together. Passengers interested in a more traditional dining experience will not be disappointed by the range of fine restaurants located throughout the ship, and those looking for a quick snack or casual bite will appreciate the pizzeria, ice cream parlor, and International Café. Activities onboard the Emerald Princess ranges from sophisticated to laid-back. Guests of refined taste will enjoy art auctions and high-end shopping, while those looking to relax can indulge in cruise ship classics such as swimming pools, fitness activities and open air movie showings. Unique to Princess ships are the “Discovery at SEA” Programs, an educational series based on the popular TV channel. Go stargazing on the ship or have an adventure on shore under the guidance of some of the most trusted experts in world travel. 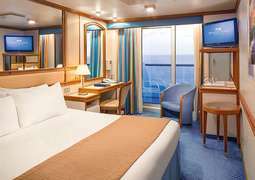 Princess cruises are defined by a casual on-board atmosphere, with guests encouraged to dress comfortably for the weather in the ship’s current location. Casual sportswear is appropriate during the day, while nicer clothes are encouraged for fine dining in the evening. 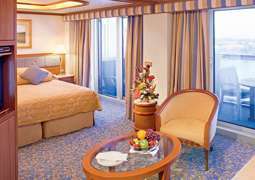 Longer cruises will additionally have at least one formal night. On formal night, guests are asked to wear formal evening wear, such as evening gowns, tuxedos or suits. 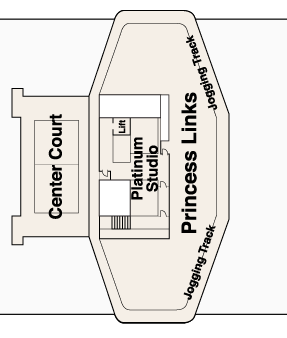 The Emerald Princess is a Grand-class vessel from Princess Cruises. The vessel entered service in June 2006 and since then it has given many passengers the pleasure of traveling aboard its wonderful 15 decks. A modern mega-ship is featuring numerous fun shore excursions, allowing cruise guests to make the best of both the ship and the destination. Refuel, recharge and relax, the Emerald Princess is your escape from the fast pace and pressure of the city life. Sail on this relaxed ship to South America and Mexican Riviera among other memorable destinations. Like the other Grand-class ships, on the Emerald Princess the ambiance is relaxed. Evenings seem to be more about relaxed dinners than gimmicky rides and slides. Of course, the ship offers a range of shops, boutiques and lounges. For kids and families, Emerald Princess has something for every day. Sit back and enjoy Movies Under The Stars. Ship crew dish out the popcorn and thick blankets are available for when it gets chilly. Board games, events, arts and crafts are going on all over the cruiser throughout the day making family time a great time at the sea. Go ahead, have the cruise you have been wishing for. Once onboard the Emerald Princess, you will enjoy dining options that are rich in flavor and ambiance. Savour dish after dish of Princess chefs who insist on serving the very finest cuisine. For a fantastic bistro with spectacular vistas, visit the Horizon Court Buffet and Bistro. The Salty Dog Gastropub features innovative gourmet creations along with classic favorites. This warm and inviting gastropub is worth a visit and trying out its wide-ranging menu of original Umami Burgers, Maryland-style crab cakes and lobster mac & cheese. For a taste of variety, be sure to check out the intimate Chef’s Table Experience with its specially designed menu and take dining to a new level! In any case, this ship is a real gastronomical adventure.